The Pocket Pilates App by D4 Pilates is the perfect companion to keep you active between classes and help you make Pilates part of your daily routine. 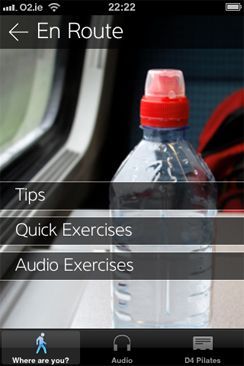 The text and audio exercises can be done anywhere, whether you are at home, at your desk, on holiday or on the go. Requirements: Compatible with iPhone and iPod touch. Requires iPhone OS 2.2 or later. WiFi, Edge, or 3G network connection required for most content. Choose your location, either at home, at your desk, en route or on holiday. Then choose a quick exercise, tips or an audio class. Enjoy your exercises and make Pilates part of your daily routine. Many features. One stands out: workouts with audio. 10 to 15 minute segments. Exactly what I wanted. I can't go to class everyday, but I can do this everyday." Now you can seize the day, get drawn in by Christie's lilting voice to guide you through those moves you never thought you'd be doing in the strangest of places." This app offers everything for those of us who need a reminder that flexing is fabulous. The 'no sweat' solution to keeping fit. You will feel better as soon as you download!" This is so accessible. No matter where you are or what you're doing, there's something for you!" Will this app teach me Pilates? No. Pilates is best taught under the watchful eye of a trained instructor. This app is for experienced students of Pilates who want to supplement their classes with daily exercises. The Pocket Pilates App costs $1.99/€1.59/ £1.49. For this you get all of the exercises, plus regular audio and text updates. You also get the D4 Pilates podcast streamed directly to their iPhone and all the latest news from the D4 Pilates blog. Yes. 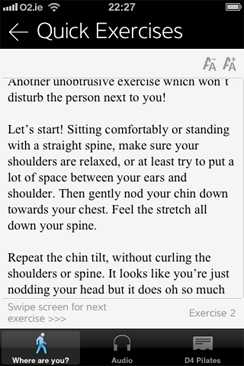 Those who download the app get regular updates of quick exercises and audio classes. And with push notifications you'll know about new exercises the instant they become available. Is the Pocket Pilates App available on the Android system? An Android version of the app will be available by mid-May 2012. D4 Pilates began in 2006 as a few classes in a North Dublin parish centre, and has grown into a bustling practice throughout the city, primarily in the Dublin 4 postcode. That’s how it got its name. D4 Pilates classes help clients meet specific health and fitness goals, making it easy to fit Pilates into a busy lifestyle while still maximizing results and having fun! It offers group and individual mat classes, pre- and post- natal Pilates sessions, a trademark Pilates + Ballet fusion class, and individual reformer workouts on request. Christie started intensive ballet training as soon as she could put on her own slippers, dancing professionally for companies in Texas and Boston before eventually turning to a career in journalism. In between writing for the arts and entertainment pages of newspapers she started taking Pilates reformer and mat classes for fun, getting completely hooked under the tutelage of Amy Ell and Paola Georgudis at Core Fitness in Houston, TX. She trained as an instructor with the PhysicalMind Institute, continuing on with Pilates Performance Ireland in Dublin after marrying her Irish husband. She now teaches between 12 and 15 classes each week in Dublin, including Pilates+Ballet fusion, which combines a Pilates warm up with standing exercises and ballet-inspired movements. When not in the studio creating new routines, making up playlists or figuring out where to host a Pilates retreat, she is writing and spending time with her husband and two amazing children, always thankful that Pilates keeps her in touch with the joy of movement while meeting new clients and friends. Pointers on how to integrate Pilates into your daily routine. Quick text exercises that you can do anywhere. Ten-minute audio classes from Christie Seaver that you can do wherever you are. The D4 Pilates Podcast streamed straight to your iPhone. All the latest Pilates news from the D4 Pilates blog at your fingertips. Photos added to Quick Exercises in all sections. Airline audio workouts now streamed from device. No network connection needed. For more information or support for the Pocket Pilates app or D4 Pilates, just send us an email. We'd love to hear from you! Copyright © 2012 D4 Pilates. All Rights Reserved.